Dragons Fire is a 5 reel, 40 payline slot with an oriental theme and it is extremely popular here at https://www.easyslots.com. In this slot, you'll find fierce and mighty dragons and a bunch of dragon eggs waiting to be hatched. Spin to find out if the eggs hatch baby dragons or golden coins! The design is very bold with vibrant shiny colours on the reels set against a dark background. 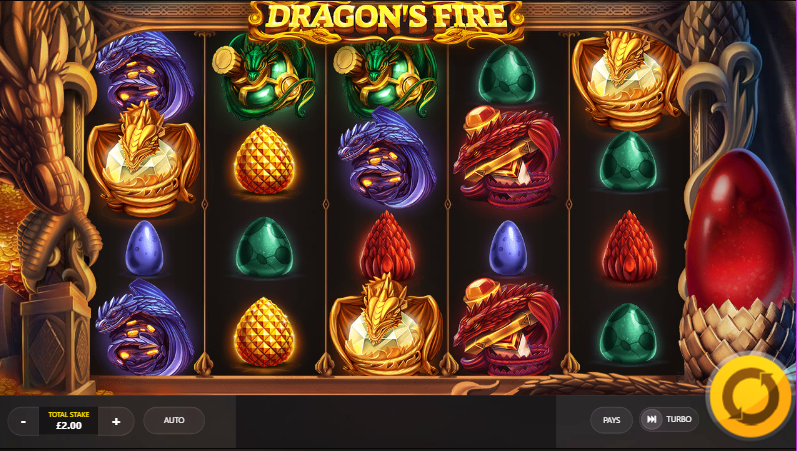 Dragons Fire is an entertaining slot with innovative features including a fire-breathing dragon who scorches the reels to award various prizes and a dragon's egg multiplier feature. Dragons Fire is a fiery 5 reel, 40 payline slot created by Red Tiger Gaming with lots of fun and casino promos. It has a roaring oriental dragon theme with stunning graphics and a relaxing oriental soundtrack. Behind the reels, you'll see golden architecture with a giant red dragon's egg on the right side of the screen. Symbols include green, blue, red and gold dragons, as well as green, blue, red and gold dragon eggs. 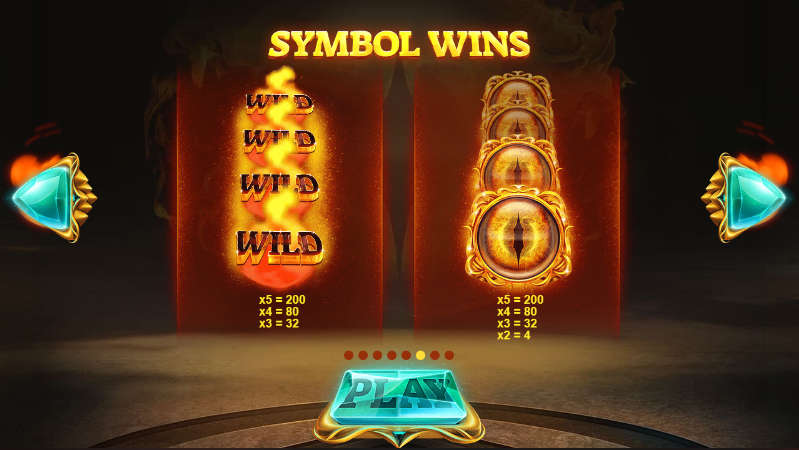 You can activate the Dragon’s Fire Free Spins by finding three of the ‘Free Spins’ symbols anywhere on the reels at any one time. Then, pick a golden dragon to enter the bonus feature. Once you have played through the free spins, any wins will be added to your overall balance. Dragon's Egg Multiplier - After every winning payline, the dragon's egg multiplier feature will unlock. For every win once activated, the multiplier value will increase. The top multiplier up for grabs here is a multiplier of 50x. Dragon’s Eye Boost - The dragon's eye boost feature will activate randomly during the game. The dragon's eye can increase your winnings by adding a multiplier of up to 10x on a dragon's egg multiplier. Fire Blasts - The dragon flies across the screen randomly during the main game. When you see him, he will breathe fire across the reels leaving behind wild reels or free spins. Dragons Fire is a fairly straightforward game. To key to successful winning combinations is to create lots of winning spins where multiplier are added. The visuals are beautifully done with bright colours and fierce looking dragons. There is also a great oriental orchestral soundtrack which goes perfectly with the theme. The features in this Red Tiger Gaming are also great, especially the dragon's egg multiplier where you can pick up many hot prizes. With each spin, you could win up to a whopping 10, 000 times your total stake. So, play slots at Easy Slots today!